Gallagher is a summer camp like no other. The cabins are rustic. The sunsets are stunning. Barefeet aren’t only allowed, they’re encouraged. 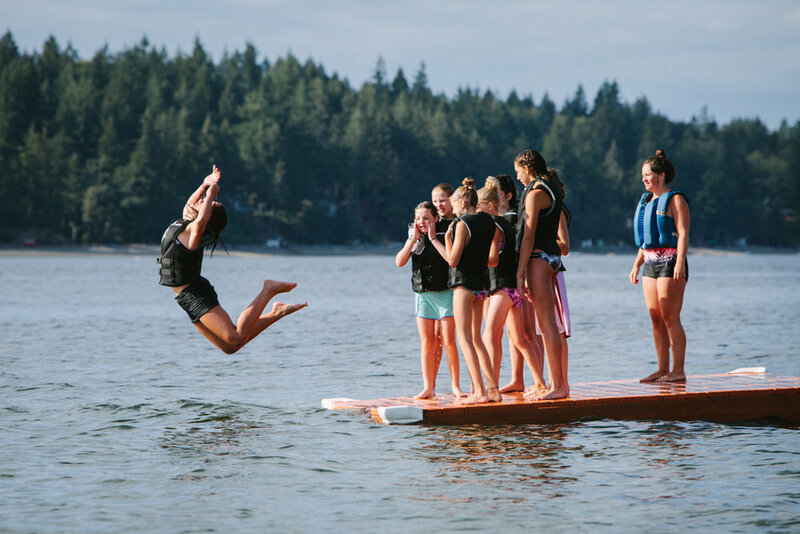 It’s a place where middle schoolers and high schoolers can embrace nature, friendship, adventure and stewardship in a truly spectacular setting. Away from the stresses of homework and the pressures of social media, it offers teens a much-needed connection to each other and their natural environment. 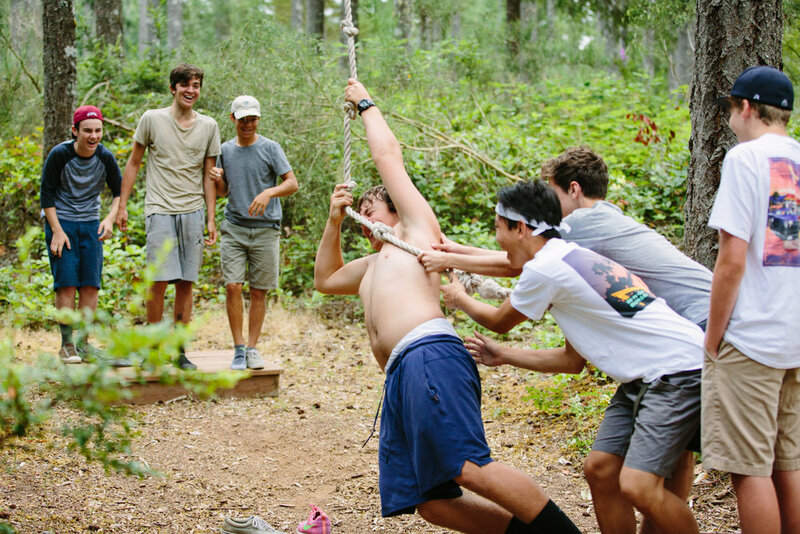 At Camp Gallagher, the campers take the lead. It’s up to them to choose the week’s theme, their daily activities and even the time they wake up each morning. Halfway through the week, lodge groups head out on overnights, paddling or sailing to a campsite on the South Sound where they sleep under the stars, cook their own food, and set their schedule according to the tides. Although always under the supervision of our highly trained staff members, campers are given the freedom to own their experience and contribute to camp in a truly meaningful way. Boating — During there week there are plenty of opportunities for campers to enjoy the sparkling waters of Case Inlet on paddleboards, kayaks, canoes and sailboats! Vertical Rope Course — The latest addition to camp, our vertical playpen is a high ropes course suspended high up in the evergreens just up the hill from main camp. The playpen gives campers the opportunity to move out of their comfort zones, while also encouraging team-building among lodge groups. Meals — Breakfast, lunch and dinner are a chance for the whole camp to get together and enjoy some delicious meals prepared from scratch by our amazing cooks. Campers are always a bit surprised just how much they love the food at Gallagher! Overnights — These one or two-night excursions around the Puget Sound are a longstanding and beloved Gallagher tradition. Whether traveling by canoes, BIG canoe, sailboat or kayak, lodge groups bond together during overnights and discover the power of teamwork. Once at their campsite, campers work together to set up camp and cook over an open fire. They return to main camp with stronger friendships and plenty of inside jokes! Sundown — Our nightly sundown ceremony gives campers the opportunity to address the entire camp and share whatever’s on their minds. We listen, sing songs, watch the sky light up in reds, oranges and purples, and then run to the water’s edge to skip stones. Campfire — At the end of each day, the entire camp gathers around a roaring campfire on the beach. Songs start loud and fast, then slow down once the stars are out and it’s time to head back to the cabins for some well-earned rest. Theme Night — One night a session we skip campfire and hold a theme party instead. Centered around the week’s theme (e.g. “Decades,” “Holidays,” etc. ), theme nights vary from session to session. Past theme nights have included, the Gallagher Sundown Film Festival, Camp Gallagher prom, Casino Night and Halloween in July. Earlybird pricing: Get $20 off if you register before Valentine's Day!